The house opens differently in January for lots of reasons! We’re not as busy as usual so we take the opportunity to open in other ways. We run special Behind Closed Doors Tours which go into not usually seen parts of the house. You get to go down to the cellar and up to the water tower and we have some extra time in the main part of the house to get some of the deep clean done in awkward areas. We also use January opening to get any building or decorating work done – this year we had the painters in to decorate the Morning Room Corridor. This year, following the success of our Winter Tree and exhibition round the house we also have a special Kaffe Fassett exhibition. It’s in the house in our exhibition rooms, open from 12 to 2.30pm (last entry at 2pm). Come along and see what we are up to! Categories: collection, conservation | Tags: Behind Closed Doors, exhibition, House, Kaffe Fassett, Tours | Permalink. You may have seen our current exhibition is on a small firm of Victorian potters, the Martin Brothers. The Martin Brothers were four brothers who set up their own pottery business. They were unusual because they designed, made, fired and sold all their own ceramics, well before the advent of Bernard Leach and the studio pottery movement. Wallace, the eldest brother, was the driving force behind the pottery. He trained with a stonemason on the Houses of Parliament and with Alexander Munro, a Pre-Raphaelite sculptor and had attended evening classes at the Lambeth School of Art which was closely connected with Doulton Potteries. You can see these influences in the work he did in the pottery, including their best known work – the wally birds, crafty caricatures of people Wallace came across when selling their pottery in the City. Walter was an extremely skilled thrower who could throw very large vessels and Edwin was a jack of all trades until later when he developed his own, more abstract style. Charles, who isn’t in the photo above, ran their shop in London and dispensed ideas and inspiration. We worked closely with Ealing Council’s museum service to put together this exhibition, and were also able to borrow objects from other National Trust properties. One property, Knightshayes, came up with a novel idea to fill the gaps left on one of their mantelpieces. We were lucky enough to get David Battie, formerly of the Antiques Road Show, and fan on the Martin Brothers to open the exhibition for us. Having not been a fan of the “pots” he was working with at Christies, he became a convert the moment he set eyes on a Martin Brothers wally bird. Not everyone is such a fan though, but we hope that everyone has an opinion and can appreciate the craft involved in creating these ceramics. The exhibition is on until the 13th November – come and let us know what you think! Categories: collection | Tags: Arts & Crafts, ceramics, collection, exhibition, Interpretation, Standen | Permalink. On Saturday, on what must have been one of the windiest days of the year, Standen re-opened for the new season*. This past week has been a mad dash to finish cleaning; put showrooms back together; set up exhibitions, and squeeze in a pre-season meeting for staff and volunteers – all before the weekend! I’m not sure how, but we somehow managed to do everything by Saturday morning, and despite the weather, there were plenty of hardy souls that came for a cuppa and a browse in the shop, a blustery walk round the gardens, and to see what was going on in the house. 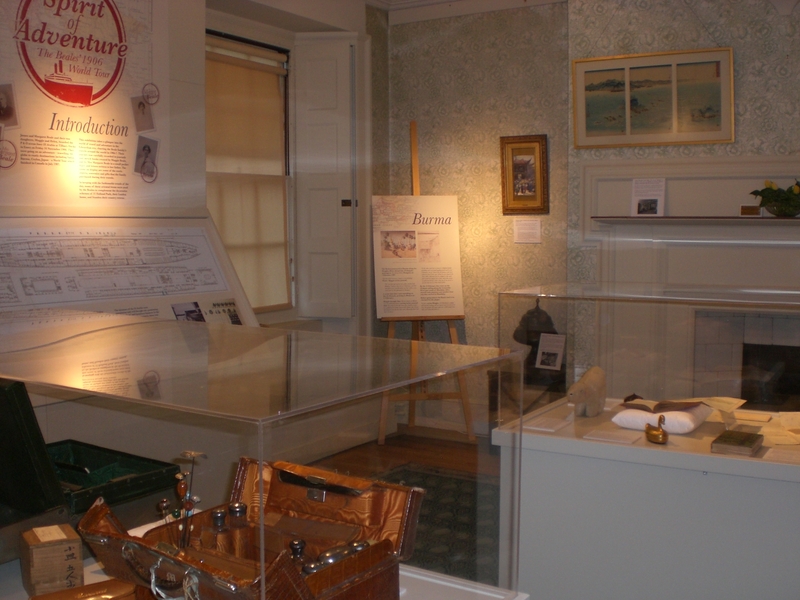 I spent some of last week helping to install our latest exhibition; Spirit of Adventure, which focuses on the 1906 world tour of the Beale family – Standen’s creators. The exhibition has been guest curated by Standen’s researcher, Anne Stutchbury, and features souvenirs, guidebooks, maps, diary excerpts and watercolour paintings from the family’s travels. *From now on, we’re open all-year-round (excluding Christmas Eve and Christmas Day)! Categories: Uncategorized | Tags: 363 opening, cleaning, exhibition, Hannah, House, Interpretation, National Trust, Standen, volunteers | Permalink.